The tour is 5-hour long and can easily fit in your schedule. Travel to the outskirt of Hanoi and get to see the scenes of northern delta countryside along the way. We get to Tho Ha after an hour driving. The village lies by the side of the Cau River. Tho Ha is among good example of a Vietnamese village that somehow escapes urbanization. Here, life goes on the way it has been for many years. We get to walk through the village gate, sit underneath the banyan tree, pass by the communal house, etc. 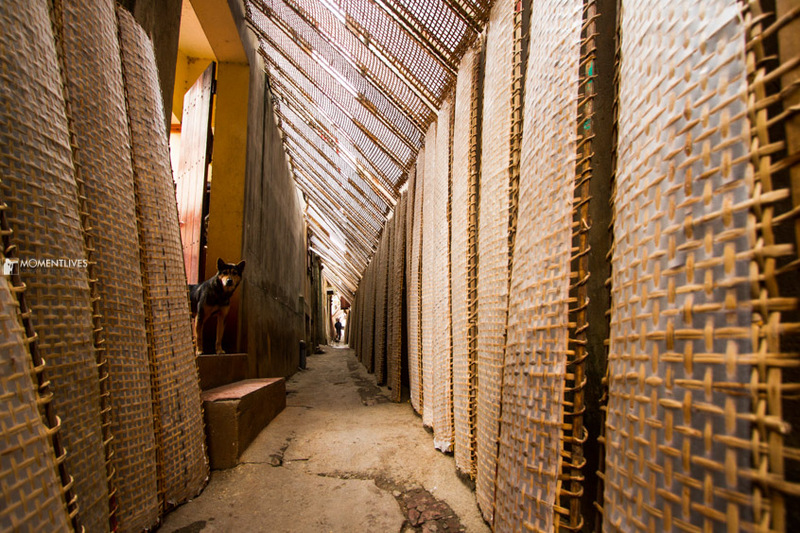 The design of the village follows the Vietnamese architecture with narrow alleys winding way through the community. Among the special things, are the coffin walls. Many of them are built from…ceramic coffins (well, no corpse inside). Once upon a time, they were made for sale. People of Tho Ha have long involved in making rice paper – an integral part of the famous Vietnamese “Nem” or Spring Roll. It is truly photogenic when seeing the local hanging rice paper on bamboo lattice racks, and then putting these racks on house roofs, village alleys or any open space for drying. Under certain light, these rice papers make perfect golden patches for your shots. During the trip, we make our way along the narrow village paths, pay random visits to different households in search of photogenic scenes. The friendly local doors are wide open once knowing we’re here to visit. This morning, we will see into our different camera modes and check what we can do at different light conditions to generate the best shots possible. This 5-hour trip will easily fit your schedule well while enriching your travel and photography experience. The local people are friendly and our staff will of course respect them by asking for permission to go inside, where you can witness the life and the work of the local. Step out of your comfort zone by breaking the thought of privacy invasion, since the concept is translated as “friendly visits” by the local.